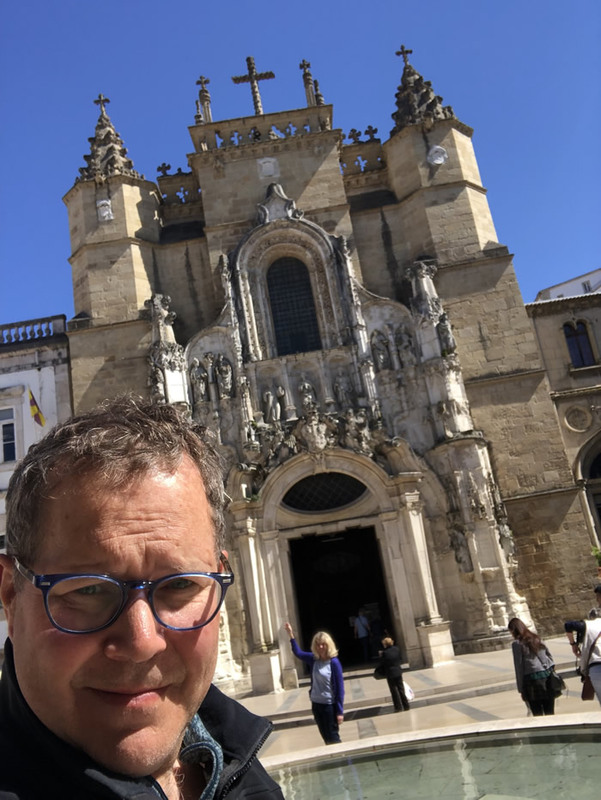 Sharing an affinity for mid-sized university towns with Rick Steves, we took a train northbound to Coimbra, home of Portugal’s most elite university, the third-oldest in Europe. JK Rowling got her inspiration for Hogwarts here. Tourists pay to visit university sites such as the ornate 300-year-old King Joao’s Baroque Library. 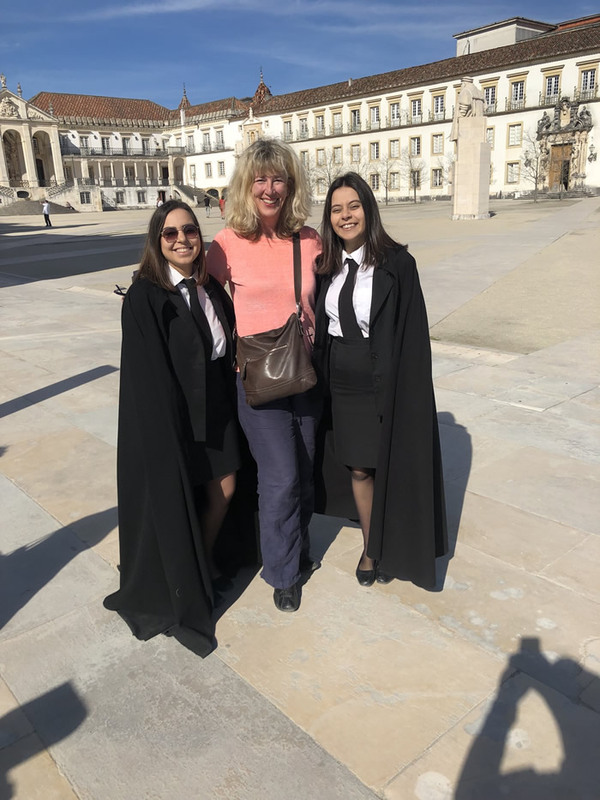 https://www.uc.pt/en/informacaopara/visit/paco/library Outside on the main courtyard, pairs of smiling female students adorned in university uniforms and capes regularly approach visitors, asking if they speak English. The answer yes pleases them. The young women sell tourist trinkets like historic postcards and notepads, trying to save money for “paying off student loans,” one of them explained. “Pay whatever you want,” they say. I am a sucker for students and offer a few euros for their postcards, using it as further opportunity to quiz them about their academic lives. We met senior students in law and medicine. 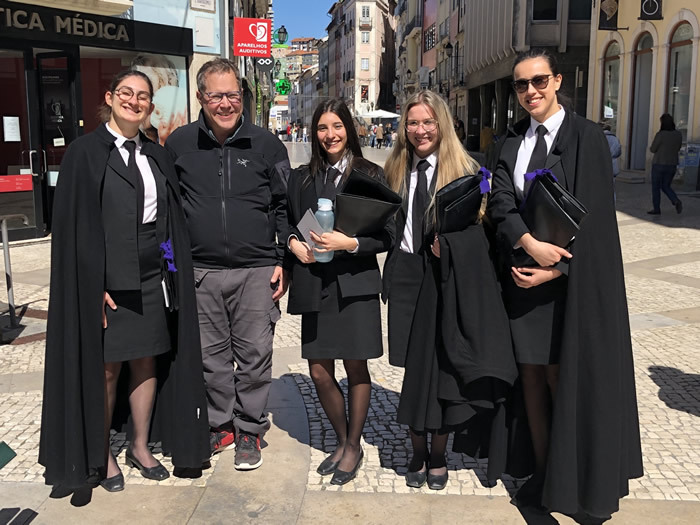 In the US, these would be post-graduate studies, but in Portugal--like much of the world--students go directly from high school into professional programs. 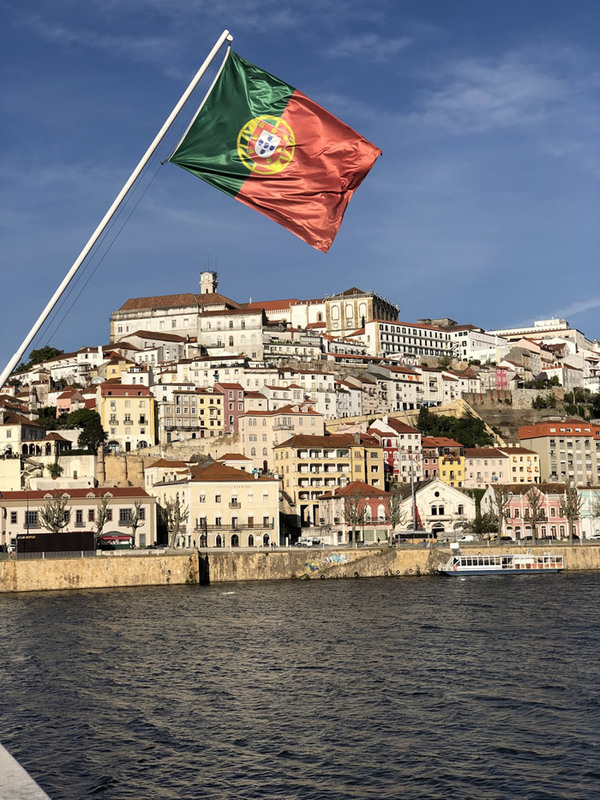 Portugal has socialized medicine, with the exception of dentistry and optometry, making these more lucrative careers here. Yet given the poverty, few people can afford to see a dentist regularly. Eventually I knew I couldn’t push Jim any further with my student handouts, despite so many interesting conversations. Even when we’d answer “no,” the women still smiled and offered photo opportunities with us...which we always took. After the university, we visited the town’s cathedral. There in a hallway, another female student sat behind a counter and asked if we spoke English. She sold quality tourist books of Coimbra along with a bookmark and a small piece of pastel art of our choosing. E 10. “To raise money for poorer students,” she said. Jim described how we’d just shelled out for postcards with other students. She scowled and said, “Oh, they are just raising money for their end-of-the-year-parties!” Jim and I visualized wild graduation celebrations involving port wine chugging, cape-tossing, and possibly Hogwart ritualizing. Down in the city square, another couple of caped postcard-selling gals conferred and inched toward us. Jim mentioned what we’d heard about party-time fundraising. They wear formal black and white, with sensible shoes. They are unfailingly cheerful and polite. They have something to sell you, but are gracious when you decline. When we travel, we prefer to spend as few days as possible moving from city to city. 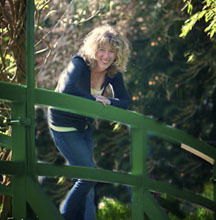 We like to hang around a place for a while to get more a feel for it than for the train or bus station. We also look for apartments or nice hotels one step down from the fanciest, picking more square feet (square meters here) where we can spread out. We go for room over the Ritz. Other than the Amsterdam Airport Sheraton the night before our flight home, our accommodations on this trip come with some serious years and history. Adding walls and modern conveniences (i.e., hot showers) can be challenging with centuries-old buildings. You don’t want to damage what made the space special in the first place. Ta-da! A new trend, a creative solution to this problem, a resolution to historic remodeling: PODS! 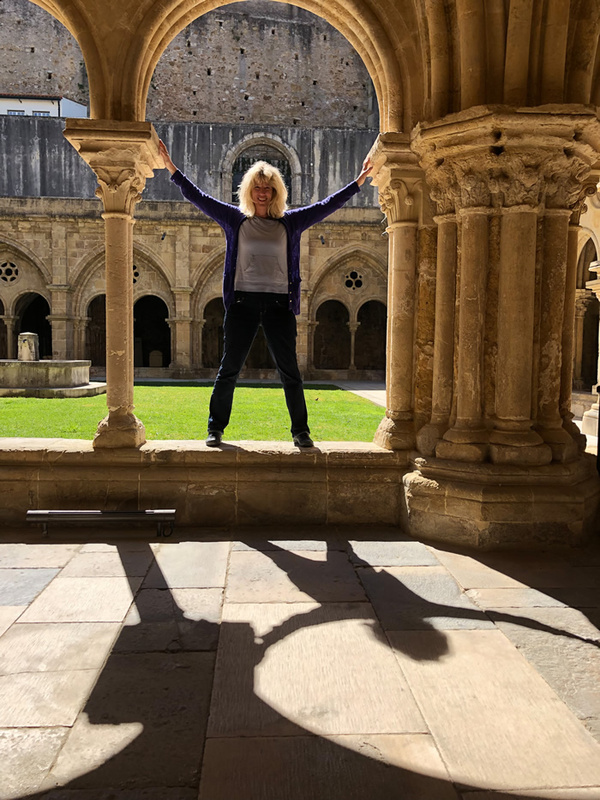 Here in Coimbra, our 1700‘s apartment includes architectural features such interior french doors, transom windows, and 18-feet ceilings with ornate carved borders. But I don’t think any significant updating happened here until recently. To protect the apartment’s integrity, the owners installed a plumbed pod in the living room. This big, black cube has a roomy bathroom at one end and a kitchenette at the other. Mostly it functions well except it has zero ventilation and the shower seeps out onto the floor. But no problem, the pools stay within the pod. Back in Sintra, we had a smaller version of a pod, like something you’d find at IKEA. Once a garage space, our apartment originally had no kitchen or bathroom. 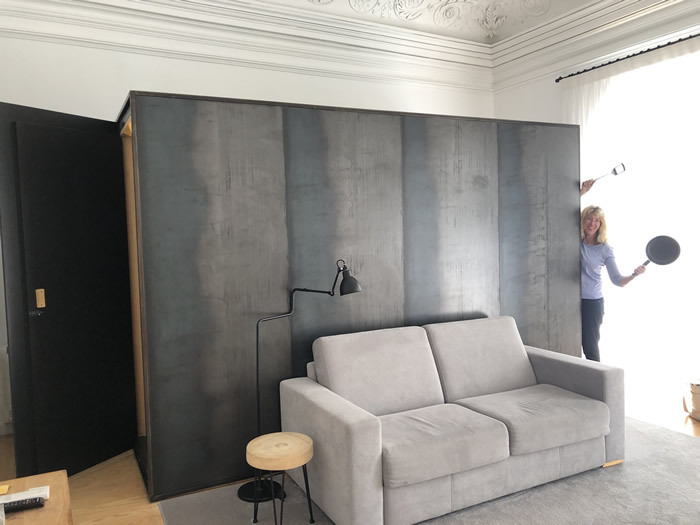 Instead of erecting a cube, our Sintra owners divided the room with a large rectangular unit. The rectangular block had a kitchen on one side and closets on the other. It didn’t reach all the way to any walls, however, leaving a gap between the stovetop and the toilet. Let’s just say this apartment required a special kind of intimacy with your traveling partner. Still, we’re decidedly pro-pod. Pods help prevent too much messing around with historic spaces. They may look peculiar but today’s designers love mixing the very old with the very modern, so that works. Count us amongst the pod people of Portugal.